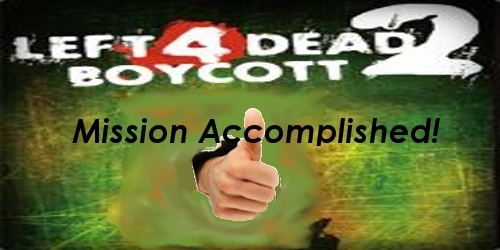 The much publicized, discussed, and debated (at least over the Internet) Left 4 Dead 2 boycott has finally come to end; not with a Tank roar, but a flood of self-congratulations and back patting it would seem. Ars Technica reported yesterday on the forum post that brought the boycott to an end by the two members of the Steam community that began it all, Agent of Chaos and Walking_Target. You may remember that it wasn't that long ago that these two gentlemen also snagged themselves a special trip to Valve, courtesy of Valve. So what does this mean for all the L4D fans out there? Well, it's ok to buy and enjoy the co-op goodness of L4D2 because L4D will still be supported... you know, like Valve talked about months ago. Page created in 0.5139 seconds.